Valuing a company is typically done based on either Value Pricing or Market Pricing. Value Pricing is what mature, stable, normally profitable businesses are bought on, and how Private Equity evaluate companies. Market Pricing is VC’s (and founders) set a price using external factors. Scaleworks Venture Equity sits in the middle with a Growth Pricing method. Obviously there’s a ton of depth and complexity in the details of how to value companies, and people far more expert than I am have spent years doing it, and written extensively on the subject. My goal here is to write about how Venture Equity (what we call the Scaleworks Fund model) fits in the macro landscape between value and market pricing. Ben Graham is the probably the most famous proponent of value buying (and his student Warren Buffet too, albeit wanting to avoid ‘the last puff of the cigar’). A Value Buyer — like a Private Equity firm — will value the business on it merits TODAY. Most likely a multiple of profitability, sometimes a revenue multiple if it’s a tech company with a leadership position and predictable revenue. They will look at the ability to leverage debt on the company as part of the transaction — effectively reducing their capital outlay — and the ability for the company’s cash flow to pay this down. They will also look at the ability to optimize operations and increase cash-flow and profit margin. 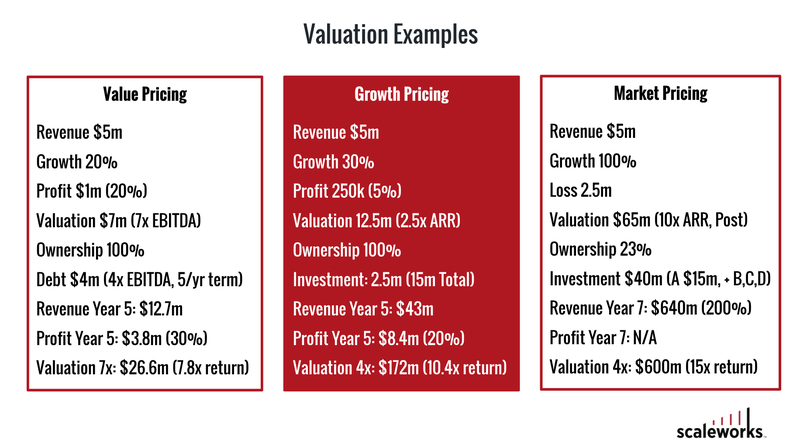 Ultimately — a Value Buyer might buy a company for $100m, leverage $50m in debt, which the company pays off over 5 years while still maintaining some growth, and end up with $50m in equity investment with no debt and strong cash-flow — worth probably 3–4x their initial outlay. Then there’s Market Pricing — typically how VC’s, and founders raising money, value early-stage ventures. This method is a little less scientific — competition from other interested parties, or a hot company with options, can end up setting the price. If that doesn’t set it — they can look at public company multiples and where available, private company rounds, in the same or a related space. What drives a price up — other than competition — is the implied future growth rate (exponential of course!) in a market that is both very large (at least $1bn) and where the company has an opportunity to be a leader or successfully disrupt the incumbents. Growth Pricing is how we in Scaleworks think about valuing companies. Because we’re not quite Private Equity and not quite Venture Capital — we won’t find companies where value pricing works, and we won’t find upside in market pricing rounds. Growth Pricing as a valuation method is where we value a company (often a company others find difficulty in valuing because of low growth, size and lack of free cash flow) based on what we believe we can do with it in the future. As operators not minority stakeholders, we are not advisors we are executors — we bear the responsibility for performance. We look for a stable revenue base with low concentration, a healthy set of customers and signs of a solid organic funnel. And we look for ways we can maximize value from the current business before fueling new demand generation activity, which provides potentially higher upside. With Growth Pricing we look for the downside protection of a more mature business, and the upside opportunity of a high-growth business. Typically neither exist at the time of purchase, but the buyer believes these dynamics are present and with good execution can be realized. I realize an article like this without talking about sample numbers would be missing key details — so for illustration purposes, there are 3 examples above — from each model. All of these examples are best-case scenarios. Remember that Market Pricing has the highest model return, but also the highest failure rate. VC funds in recent times have tended to underperform Private Equity, where no failures are expected, only variations in levels of return. In Venture Equity we also expect no zeros but may experience failures to increase the growth rate or get an expanded multiple at exit. The hope would be capital can be returned from on-going cash flow or lower multiple value sale, albeit with slightly higher revenue and to a more mature buyer — like a small private equity fund. The crux of the story here is that Venture Equity is a model where the buyer values the company on it’s potential, and on their own ability to execute on that potential. The valuation is a fair present value, the deal gets done because the buyer see upside based on actions they themselves can implement. Or more plainly — Scaleworks will acquire companies we believe we can do a better job at growing than the current leadership will.